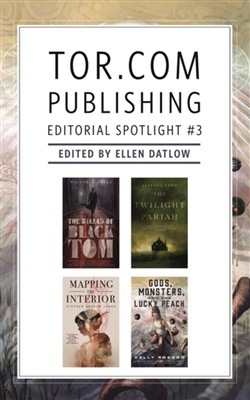 Tor.com Publishing Editorial Spotlight #3 is a curated selection of novellas by editor Ellen Datlow This collection includes: The Ballad of Black Tom by Victor LaValle The Twilight Pariah by Jeffrey Ford Mapping the Interior by Stephen Graham Jones Gods, Monsters, and the Lucky Peach by Kelly Robson “LaValle cleverly subverts Lovecraft’s Cthulhu mythos by imbuing a black man with the power to summon the Old Ones, and creates genuine chills with his evocation of the monstrous Sleeping King, an echo of Lovecraft’s "Dagon"… [The Ballad of Black Tom] has a satisfying slingshot ending.”—Elizabeth Hand on The Ballad of Black Tom "Poignant and punchy. "—The New York Times on Mapping the Interior "Brilliantly structured . . . with a delicious tension carefully developed among the wonderful characters. "—The New York Times on Gods, Monsters, and the Lucky Peach At the Publisher's request, this title is being sold without Digital Rights Management Software (DRM) applied. 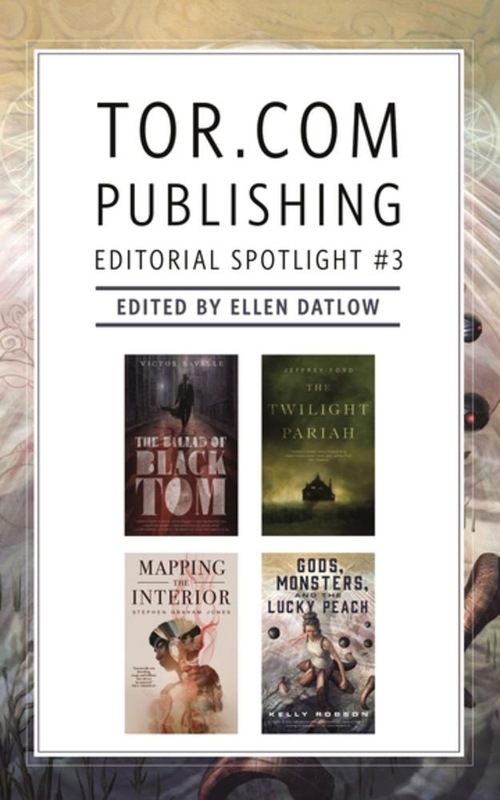 Acquista Tor.com Publishing Editorial Spotlight #3 in Epub: dopo aver letto l’ebook Tor.com Publishing Editorial Spotlight #3 di Jeffrey Ford, Victor LaValle... ti invitiamo a lasciarci una Recensione qui sotto: sarà utile agli utenti che non abbiano ancora letto questo libro e che vogliano avere delle opinioni altrui. L’opinione su di un libro è molto soggettiva e per questo leggere eventuali recensioni negative non ci dovrà frenare dall’acquisto, anzi dovrà spingerci ad acquistare il libro in fretta per poter dire la nostra ed eventualmente smentire quanto commentato da altri, contribuendo ad arricchire più possibile i commenti e dare sempre più spunti di confronto al pubblico online.